A few projects in early July provided me with a healthy break from the same old routine. 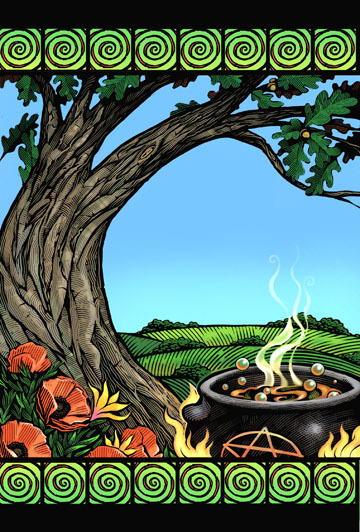 I got an assignment from Llewellyn Publishing, who I hadn’t heard from in nearly ten years to illustrate the cover of a book on the wiccan religion. The layout was pretty much done for me, but I had a bit of freedom to play around with the presentation and colors a bit. A fun project, and led to a series of black and white spots later in the year for the interior of the same book. ADDENDUM (Jan 9, 2008): I just got my complimentary copies in the mail today for this book, and it looks pretty nice. Can be purchased at Amazon here. Also, around this time, I received a commission to design and create the masthead for a stock certificate for Dolan Media, that was about to go public. This was the first time I’d ever been asked to do work of this type, and while it was a great deal of work, and went through a lot of revisions along the way, it was worth the trouble, and it turned out looking quite nice. I’m also including an enlarged image of the center section to better show the detail (and if I were to enlarge it even further, you would see that in several places throughout the illustration, some of the ‘dots and lines’ actually contain tiny little words and initials of all the people who worked on the project). A pair of illustrations for the Far Eastern Economic Review from Hong Kong came over the weekend. 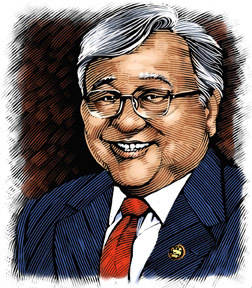 An overview illustration of ‘biomedical and genetic research’ with an ‘asian twist’, plus a portrait for another article. I really have been enjoying doing the portraits for this client, faces and likenesses are my single favorite subject matter, and I never tire of them. 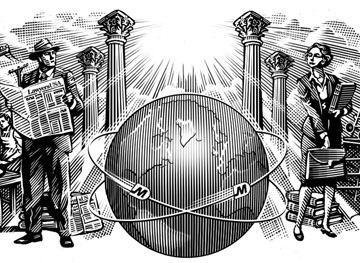 And during this time, I also completed a few pieces for the Wall Street Journal. The bi-weekly ‘health care’ column (this one on a special kind of gauze), and a black and white chart accompaniment; a pole vaulter, for a reason long forgotten. 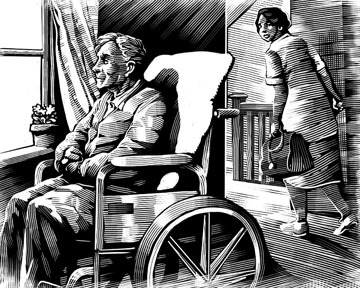 And sometime in the middle of the first two weeks of July, I also had a black and white same day illustration for Newsday; a piece on elder and in-home health care.